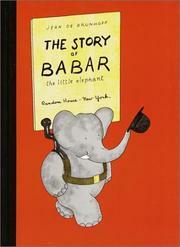 Babar is an elephant who has a wonderful adventure. After his mother died tragically from a hunter, Babar goes into the city, where he lives with a little old lady. Upon returning to the forest, Babar is elected king and is married to Celeste, another young elephant. The two set off for their honeymoon. Brunhoff, Jean de, “The story of babar the little elephant,” Children's Picture Book Database at Miami University, accessed April 21, 2019, https://dlp.lib.miamioh.edu/picturebook/items/show/6235.